Think of this bread salad as you might any other salad that includes croutons. Here the crouton is toasted pita bread, which is thin and crisp and soaks up the salad’s juices deliciously. 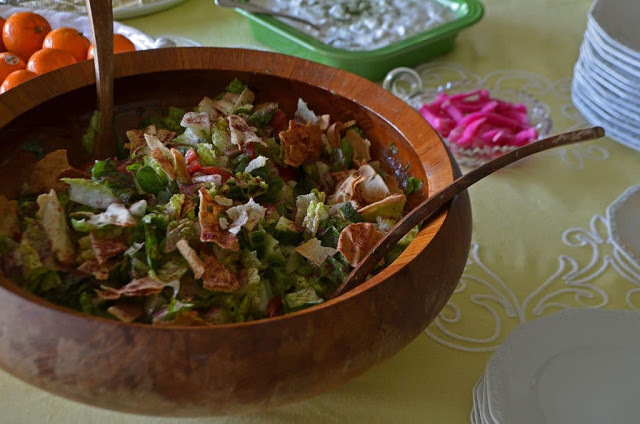 I love fattoush with firm leaves of romaine, which stand up well to the bread, but you can make the salad of any leaf you like and add whatever vegetables you like. The lemony vinaigrette is so good, it may be the only dressing you ever eat again. Preheat the oven to 375 degrees. Tear the pita bread into 2-inch pieces (using both layers of the pita per piece; this makes for a sturdier crouton). Spread the bread on a large sheet pan with a little space between each piece. Bake until golden brown, 3-5 minutes. Repeat with remaining bread. In a large salad bowl, combine the romaine, tomatoes, cucumber, and onion. Make the vinaigrette: combine the lemon juice, canola or olive oil, garlic powder, salt and pepper in a small bowl. Whisk until fully combined and emulsified. Dip a piece of lettuce in the vinaigrette, taste, and adjust seasoning. Add more lemon if you like a tart dressing. Add half of the pita chips to the salad and combine. Pour the vinaigrette over the salad and toss. Place the remaining pita chips on top of the salad, and sprinkle liberally with sumac. When the salad is finished, you’ll see juices at the bottom of the bowl. This is the best part! Sop up with more pita bread, and enjoy.